First Line: From behind his little pile of crumpled Tootsie Roll wrappers, DiGaudio said, "We can make you for the Hammer job." Junior Bender has made a name for himself in Los Angeles-- as a first-rate burglar... and as a competent private investigator for the criminal element in town. (After all, to whom are the crooks going to turn when they have a problem, the cops?) This private eye gig isn't all it's cracked up to be because it's a no win situation. Regardless whether he solves the crime or not, someone dangerous-- suspect or employer-- is going to be unhappy with him. 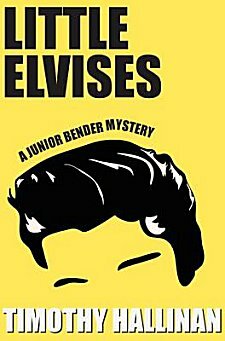 In this second book in the series, Junior has been bullied into proving that an aging music industry mogul didn't murder a nasty journalist whom he'd publicly threatened to kill. The journalist's pretty widow doesn't help matters when she tries to get Junior to mix pleasure with business. Just when his investigation starts going out of control, Junior's landlady begs him to solve the disappearance of her daughter-- and then he learns that both his ex-wife and his thirteen-year-old daughter have new boyfriends. But Junior knows better than to ask if things could get any worse. Somehow, some way, Junior Bender has to make as many people happy as possible because he most definitely wants to survive to live another day. Ever since 1968 and the television series "It Takes a Thief" starring Robert Wagner, I've had a thing for handsome, smart aleck burglars with devilish smiles and nine lives. This "thing" grew to embrace Cary Grant, David Niven, Maltese Falcons, and the debonair Remington Steele among others, so you have to know that I was thrilled to discover Junior Bender. Sure, Junior doesn't have a cool name like Alexander Mundy or the aforementioned Mr. Steele, but he's more than a match for them all when it comes to a sense of humor, a heart of gold, and quick wits. Timothy Hallinan has to have a blast when he writes these books. He gets to bring in bits of Los Angeles and Hollywood history as well as his opinion of Southern California in general. He gets to create some hilarious characters, some downright scary characters, and a few characters that really know how to tug on the heartstrings. As much as I love the people Hallinan has created, his plots are every bit as much fun. Although I do like to attempt to puzzle things out as I read a mystery, I throw my hands up when reading about Junior Bender. Hallinan's plots are even more crooked than San Francisco's Lombard Street; just as I think I know how one thing is going to be resolved, the author proves that I couldn't be more wrong. It's better to just sit back, fasten your seatbelt, and put your tray table in its upright and locked position. You're in for one fantastic ride-- and you're going to be cheering for Junior Bender all the way. Cathy - You're not the only one who likes smart-aleck burglars like that. And they can be excellent characters if they're also believable. I think you put your finger on something else critical as well: Hallinen obviously enjoys writing. When it's that obvious, the story just moves along all the better because that enthusiasm is infectious. Oh, and I love the title of this one. You're exactly right: whenever someone loves what they're doing, that love shows and is incredibly infectious! I just moved this a lot nearer to the top of my TBR wish list. I may even get to it this year - and I'm looking forward to that! I did some hunting to find an official answer to your question, Kenneth, and found none, so I'll share my own opinion with you. I'd say that these Junior Bender books may be a bit too mature for your 12-year-old grandson. Not much, but I can see him enjoying them when he's fifteen or sixteen. Hope this helps!